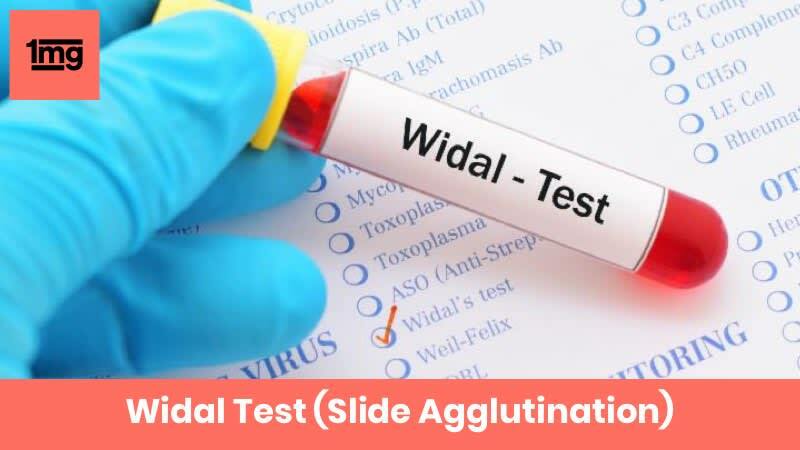 What is Widal Test (Slide Agglutination)? Widal test (Slide agglutination) is a blood test which detects Enteric fever (Typhoid fever and Paratyphoid fever). Enteric fever is a systemic infection caused by bacteria, mainly because of the ingestion of contaminated food or water. This test is performed using the slide agglutination method. Why is Widal Test (Slide Agglutination) done? To diagnose Enteric fever (Typhoid and Paratyphoid fever). What does Widal Test (Slide Agglutination) Measure? The Widal test measures the titres of antibody against the bacteria which cause Enteric fever. Typhoid and paratyphoid fever are generally acquired when you consume food or water, contaminated by feces of an acutely infected or convalescent person (recovering from disease) or a chronic, asymptomatic carrier. The incubation period (the time interval between exposure to an infection and the appearance of the first symptoms) of Enteric fever is 6-30 days. Typhoid fever has a gradual onset. In the beginning, there is an increasing feeling of fatigue along with a fever which increases with every passing day. By the fourth or fifth day the fever may vary from low-grade to as high as 102°F–104°F (38°C–40°C). Known as the Stepladder fever pattern, this was once the hallmark symptom of Typhoid but is now witnessed in very few cases The patient may suffer from a headache, weakness, and loss of appetite. Abdominal pain, diarrhea, or constipation are common but not threatening. A transient rash of rose-colored spots can occasionally be seen on the trunk (Rose spots). The disease can last for a month, if untreated. Early diagnosis and treatment is important as life-threatening complications of typhoid fever generally occur after 2–3 weeks of illness and may include intestinal bleeding or perforation. Paratyphoid fever is similar but often less severe than typhoid fever. Widal test is an agglutination test to detect antibodies (agglutinins) in a blood sample against two antigens (O & H) of bacteria, Salmonella enterica. Agglutination refers to the visible clumping of particles when a particulate antigen combines with its antibody in the presence of optimum conditions for antigen-antibody reaction. When this test is performed on a slide, it is called Slide agglutination and when it is carried out in a test tube, it is called Tube agglutination. Widal test by Tube agglutination is recommended over Slide agglutination method. The antigens used in the test are “H” and “O” antigens of Salmonella Typhi and “H” antigen of S. Paratyphi. Widal test should only be performed after the first week. The reason being the antibody against “O” and “H” antigens of Salmonella start appearing in serum at the end of the first week of fever. It is preferable to test two blood samples at an interval of 7 to 10 days to demonstrate rising antibody titres. If the antibody against Salmonella is present in the patient’s serum, it will react with the respective antigen in the reagent and give visible agglutination (clumping) on the test slide. The highest dilution of the patient’s serum sample that gives a visible agglutination with the Widal test antigen suspensions is the antibody titre. The serum sample which shows the titre of 1:80 or more for O agglutination and 1:160 or more for H agglutination indicates active infection. A rise in titres (4-fold or more) in the two blood samples taken 10 days apart confirms the diagnosis. Please note that different labs may have different reference values for the interpretation of the Widal test. The interpretation of a Widal test is greatly influenced by the nature and extent of the patient’s previous contact with typhoid antigens. It can be either due to clinical or subclinical infection with typhoid or related organisms or from typhoid vaccination. The lesser the extent of the previous contact, the greater is the usefulness of the Widal test. Q. What are the different methods for performing Widal test? Widal test can be performed by the following two different methods: 1. Slide agglutination Widal test Qualitative Slide Test Quantitative Slide Test 2. Tube agglutination Widal test Tube agglutination is the recommended method as it has more accuracy. However, Slide agglutination is preferred by some as it gives the rapid result. Tube agglutination method requires approximately 18 hours for test completion. Q. What are the limitations of Widal test? Q. What are the other tests to diagnose Enteric fever? The other tests which are used to diagnose Enteric fever include: Blood culture test Typhidot test Stool culture test Urine culture test Blood culture is the recommended method for diagnosing Enteric fever and is performed during the first week of fever. Bone marrow sample can be used for diagnosis if other tests are inconclusive. Q. How can you prevent typhoid fever?